(Telegraph) – DOZENS OF MPS HAVE EXPLOITED A LOOPHOLE in expenses rules to claim thousands of pounds of public money without the need for receipts. Parliament’s failure to demand proof of purchases for items costing less than £25 led to an abundance of claims for household goods and bills of £24, or just under. 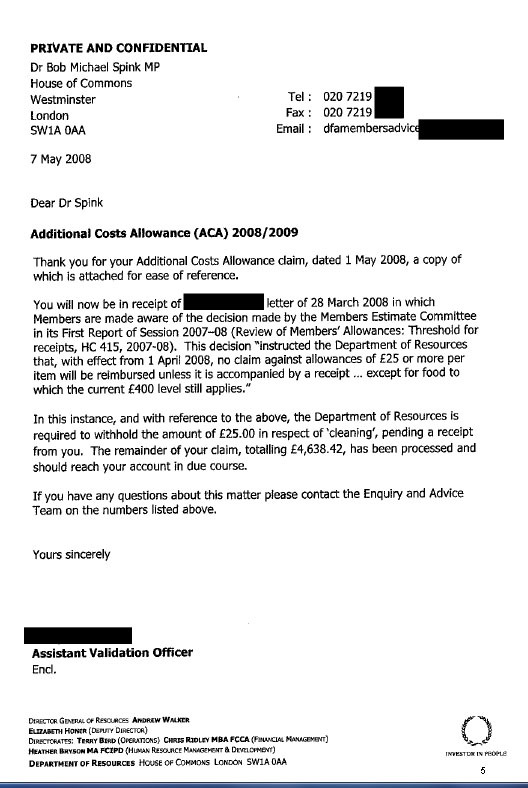 Many MPs submitted several claims each month for miscellaneous items valued between £20 and £25, which were automatically paid because the parliamentary fees office did not have the power to ask to see receipts. MPs’ expenses claims for the last financial year, released this week, also show that an attempt to reduce claims for food has failed, with MPs regularly claiming up to £400 a month for meals — the same amount they were allowed under the old system. Among those who submitted unreceipted claims for just under £25 was Kali Mountford, the Labour MP for Colne Valley. She claimed exactly £25 for phone bills, cleaning, service/maintenance and repairs, but in June 2008 the fees office refused to pay, saying she had to submit documentation to back up each claim. The following month she claimed £23 for her phone and £24 each for utilities, cleaning, service and repairs, which were all paid. Sir George Young, the shadow leader of the House, submitted a claim for £25 for cleaning. When he was told he would need a receipt, he replied, “I will forgo cleaning for May” — then started claiming £20 per month. 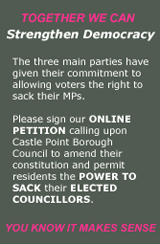 [Bob Spink, our local MP, undertook a similar strategy. When his claim for £25 ‘cleaning’ was refused by the fees office in April 2008, for having no accompanying receipt, he was careful to reduce all his following claims – including those for utilities and telephone — to just beneath that amount. His letter (inset) drew his attention to being able to claim £400 a month for food, so it comes as no surprise to find our frugal Bob claiming it in full the very next month and ensuring to take every opportunity to claim it in subsequent monthly expenses. Meanwhile, a decision to replace a £400 monthly food allowance with a £25 per night subsistence allowance appears to have backfired. The Labour MP Ann Clwyd claimed £400 for food in April, only to be told she must claim £25 subsistence for each night she had spent away from her main home. She sent in a “revised” claim for 16 nights, which totalled £400, and which was paid. (Telegraph) – RADICAL PROPOSALS to overhaul the system of MPs’ expenses drawn up by an independent review may be blocked, Harriet Harman has warned. Ms Harman, the Leader of the Commons, said it would not be fair for MPs to be forced to sack their spouses or other family members working in their offices. She also indicated that plans to stop MPs living in the London commuter belt from having taxpayer-funded second homes may prove unacceptable. For months, the Government has led the public to believe that recommendations drawn up by Sir Christopher Kelly would be introduced quickly without MPs becoming involved. However, the Commons Leader said that an outside body would now decide whether to implement recommendations from the Kelly review. This new ‘independent’ body will work under the auspices of a small group of senior MPs – many of whom have faced questions about their own expenses – sparking fears over its impartiality. The MPs will be responsible for approving the appointment of executives running the new Independent Parliamentary Standards Authority (IPSA). Sir Christopher was appointed to draw up a radical overhaul of the expenses system in the wake of The Daily Telegraph’s disclosures. However, his work has been fiercely opposed by some MPs who are threatening to rebel against the Prime Minister if the proposals are introduced. David Cameron is thought to back the introduction of Sir Christopher’s recommendations in full. Asked whether IPSA could reject Sir Christopher’s proposals, Ms Harman said: ‘It’s entirely a matter for them. But they will, I’m sure, want to draw on his important work. Gordon Brown will meet Sir Christopher today and is expected to warn that the reforms must not turn politics into the preserve of the rich, according to Downing Street aides. However, it is not clear why Mr Brown is issuing such a warning to the official watchdog – or why his feelings are being made public – as Sir Christopher’s report and recommendations have already been sent to the printers. The comments may therefore be designed to placate Labour MPs. Sir Christopher, the chairman of the Committee for Standards in Public Life, will set out his recommendations on Wednesday. He is expected to recommend that MPs are only allowed to rent a second home and that the taxpayer will not pay mortgage interest in future. MPs will also be banned from employing family members under his proposals. Those living within an hour’s commute of Westminster will also be unable to claim for the cost of a second home. Ms Harman appeared to yesterday back opposition to the ban on family members. She said: ‘If Sir Christopher Kelly recommends that MPs shouldn’t be able to employ any family members for the future and if that’s what the Independent Parliamentary Standards Authority decides I think two things: firstly there shouldn’t be any shadow cast over the existing spouses who are working very hard. ‘I think it would be wrong to judge them all as not doing a good job, I don’t believe that to be the case. The comments from the leader of the House are likely to lead to intense lobbying of IPSA from MPs. More than 100 MPs currently employ members of their families. On Sunday it emerged that Nadine Dorries, the Conservative MP, has employed another of her daughters to work in her office after she failed to find work after graduating. There are also growing fears that MPs may seek to influence the composition of the new IPSA board. The chairman and other senior members of the authority have yet to be appointed – and their appointments have to be sanctioned by the Speaker and a secretive committee of MPs. Several of the MPs on the committee have spoken out against Sir Christopher’s recommendations sparking fears that they may not wish to appoint a strong, impartial head to run IPSA. For example, Sir Stuart Bell who sits on the new committee, said that Parliament may wish to ‘amend’ Sir Christopher’s recommendations. ‘The House would want to look at these recommendations very carefully, they will want to debate them and have the opportunity, should they so wish, to amend them,’ he said. Other members of the committee include Don Touhig, a Labour MP who led a backbench revolt against previous plans to tighten up the rules on MPs expenses, and Sir George Young, the shadow leader of the House, who previously chaired the Committee which punished MPs who broke Parliamentary rules. The Committee has been criticised for failing to clamp down on abuse of the expenses system. The composition of the new committee which will oversee IPSA was quietly announced in an evening session of Parliament last Wednesday. Several MPs complained that no younger or more progressive politicians were selected for the committee. IPSA will also have to consult the new committee on the final revised package for MPs’ expenses. Downing Street sources sought to play down Ms Harman’s remarks. They said she was expressing a ‘personal view’ in relation to MPs’ employment of their relatives or spouses. (Telegraph) – THE HEADS OF THE NEW INDEPENDENT PARLIAMENTARY STANDARDS AUTHORITY will have to be approved by a committee of MPs with a questionable record over expenses and improving the transparency of the system. The special ‘Speaker’s Committee’ is headed by John Bercow. The new speaker employs his wife as a ‘research assistant’ and previously ‘flipped’ his designated second home for expenses purposes. Other members of the committee include Sir Stuart Bell, who has already attacked Sir Christopher Kelly’s recommendations. The Labour MP also employs his wife. Don Touhig, another Labour MP who employs his wife, is also on the committee despite successfully leading attempts to block reform of the MPs’ expenses system last year. He previously argued that employing independent auditors to scrutinise claims was a waste of money. Sir George Young, the shadow leader of the House, is the Conservative representative. Sir George headed the Standards and Privileges Committee which oversaw MPs behaviour. It has been criticised for failing to clamp down on abuses of the system. He employs his daughter. Nick Harvey, the Liberal Democrat representative, is the spokesman for the committee which established the previous discredited system of expenses. The final member of the committee is Liz Blackman, a former Labour whip accused of going on last-minute shopping trips at the end of the financial year to use up her second-home allowance. The Committee’s membership was announced on Wednesday evening in the House of Commons without public fanfare and with little opportunity for debate. Several MPs have complained over the composition of the group. David Winnick, a Labour MP, said: ‘When it comes to the names, inevitably the question will arise: why these people? Who nominated them? WHILE THE PRESS PACK rightly pursues errant MPs for their comments on the Legg letters they have received, it is worth remembering that Sir Thomas reports to the Members’ Estimate Committee (MEC), which is headed by six MPs whom are themselves tainted by the expenses scandal. John Bercow, the Speaker and Conservative MP for Buckingham, who ‘flipped’ his second home from his constituency to a £540,000 flat in London and claimed the maximum possible allowances for it. His expenses files reveal he also twice charged the public purse for the cost of hiring a chartered accountant to complete his annual tax return. Harriet Harman, Leader of the House of Commons and Labour MP for Camberwell and Peckham, who hired Scarlett McGuire for ‘consultancy’ services on the public purse. She also claimed for party political propaganda and bought expensive gadgets. Nick Harvey, Liberal Democrat MP for North Devon, who had to be reminded twice by parliamentary officials to submit receipts with his expenses claims. who spent thousands of pounds of taxpayers’ money renovating a farmhouse before selling it for £750,000. Sir George Young, Shadow Leader of the House of Commons and Conservative MP for North West Hampshire. Young claimed the maximum second home allowance on his London flat for the past two years and also billed taxpayers for the cost of a video camera so that he could broadcast clips of himself at work on YouTube. Public calls for Legg’s inquiry to be broadened from its original remit of carrying out an independent review of second home allowances claimed since 2004/05, are, therefore, unlikely to be satisfied. Diligent Legg is trying his best to make the most of a bad deal; but the fact remains that he is no more than a rabbit sent forth on a foraging mission before returning to the set of foxes that dispatched him. He cannot publish anything without it first being approved by the MEC. The battle to uncover the full extent of corruption in our Parliament is likely to drag on for some time. Next month will see the publication, by Parliament, of another set of MPs’ expenses (suitably redacted) and December will see the final report from Legg and the results of the inquiry headed by Sir Christopher Kelly. This issue will not go away; but it will only be resolved to the public’s satisfaction in May, at the next general election. Only then will it be possible for the electorate to ensure that any sitting MP, whom has been tainted by the expenses scandal, is not returned to Parliament. And it will be up to the local press to ensure that their citizens are kept fully informed.